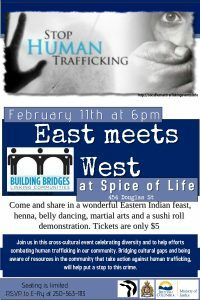 Community members, care providers and Human Trafficking Committee members gathered February 11th for our second East Meets West Dinner and event. This event took place at the Spice of Life, a local East Indian restaurant. The fifty dinner participants were treated to a n international experience with a henna artist, Tai Chi demonstration, sushi rolling demonstration and, of course, fabulous East Indian cuisine. The purpose of this event was to raise awareness of human trafficking and exploitation in our community and to enhance community partnerships as we work to support victims of trafficking and to reduce the number of victims in our community. A special thanks to the Ministry of Justice for providing the funding to make this evening possible, and to our co-hosts, RCMP Victim Services.